This one of my favorite ways to use up my frozen blueberries from picking season back in July and August. Prep Day: Spray the basin of a crock-pot with nonstick cooking spray. 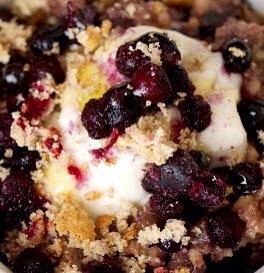 Add the oats, milk, cream, blueberries, vanilla and brown sugar. Stir the mixture to combine. Set your slow cooker to low and cook about 5 – 7 hours, if you can stir about halfway through to ensure it’s evenly mixed and doesn’t burn. Serve Day: Mix in the lemon zest and crumbled up blueberry muffin. Garnish each bowl with fresh whipped cream.